Aker Brygge name refers to the commercial area next to the harbor not far from the city center. The place was filled with cafes, apartments, and restaurants. No little classic shades antic or there, all modern and new look. Many people go through and crowded cafes or restaurants on the harbor. The cold wind did not harbor the slightest desire dampen Oslo to exist. They prefer to sit at a cafe terrace in order to see and be seen by passers-by. No need to fear the wind chill, it’s a cozy cafe stools provide a blanket to wrap the body of a cold. Aker Brygge Oslo is often referred to as the number one meeting point. The main view of the place is a port and the ship was leaning. 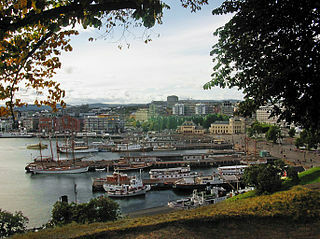 In addition, the City Hall and Akershus Castle alsocan obvious from Aker Brygge. The atmosphere was more dynamic in Aker Brygge. Although not many, some sellers hotdogs and ice cream kiosk on the open road. Crowds of people feel more full and vibrant atmosphere than in Karl Johans Gate. Hum of human voices sounded fun even in a language that tourists do not understand at all. Entering the inside of Aker Brygge artifacts few simple art installation to beautify the arrangement of space in this place. The warmer part because high buildings block the wind blowing from the port. Small children playing near the art installation that uses water as the main element, while the adults were busy enjoying the sun on the terrace restaurant. Aker Brygge is more modern and dynamic. Maybe because it was the Oslo prefer to relax and spend time there.